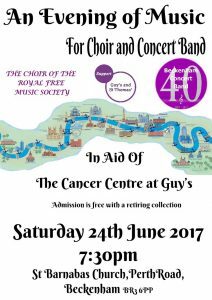 On Saturday 24 June at 7.30pm, St Barnabas welcomes the Choir of the Royal Free Music Society and the Beckenham Concert Band for An Evening of Music, in aid of the Cancer Centre at Guy’s Hospital. Admission is free, with a retiring collection. 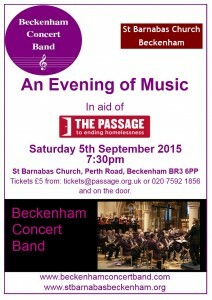 St Barnabas welcomes Beckenham Concert Band on Saturday 5th September at 7.30pm for An Evening of Music in aid of The Passage. Tickets from £5, available from tickets@passage.org.uk, on 020 7592 1856 and on the door.